Before the advent of color photography, artisans painstakingly applied color to black and white photos in order to show a truer visual depiction of a photo image. The historical Yellowstone hand-tinted photos of F.J. Haynes and his son Jack Ellis Haynes are examples of this medium. 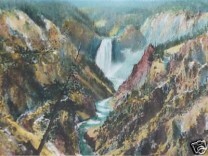 Their pioneering techniques produced beautiful renderings of early Yellowstone that still survive today.